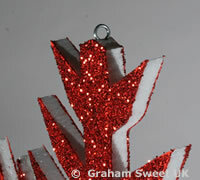 Polystyrene Christmas Snowflakes -Details - Graham Sweet Studios. 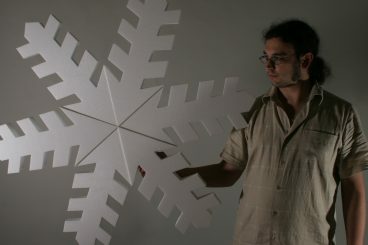 Technical details about the size and material of the snowflakes. 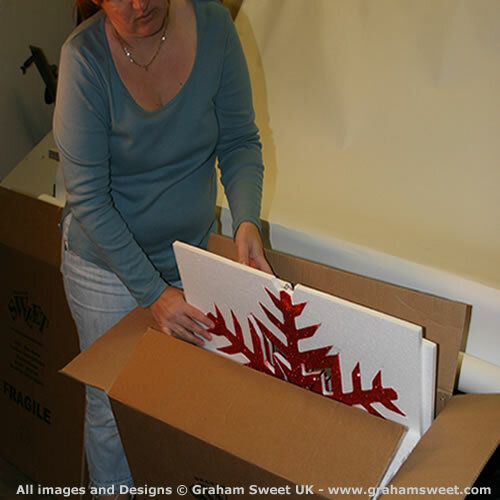 All our polystyrene snowflakes are designed and manufactured at our studios in the UK. The measurement given for the snowflakes is the longest measurement, from point to point. Please note that the snowflakes are for display purposes, and thickness may vary slightly. 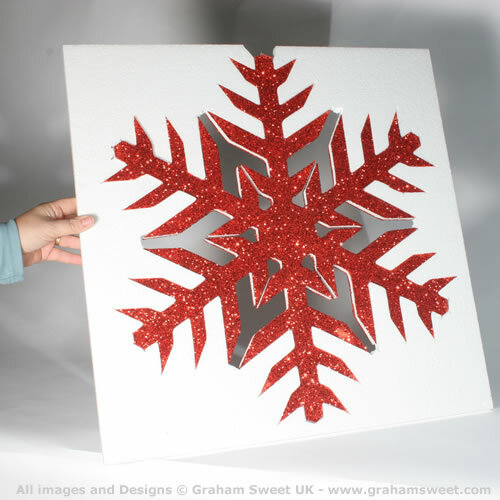 140mm and 180 mm snowflakes are normally 8 mm thick - however, when ordered along with larger snowflakes, may some times be cut from 12.5 mm thick sheet, in order to use the material more economically. 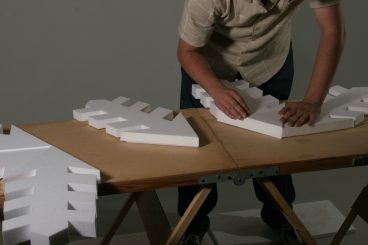 280mm, 380 mm and 568 mm are all cut from 12.5 mm thick sheet. 877 mm snowflakes are 25 mm thick, and 1145 mm snowflakes are 40 mm thick. 1500 mm, 1800 mm and 2000 mm snowflakes are 50 mm thick. 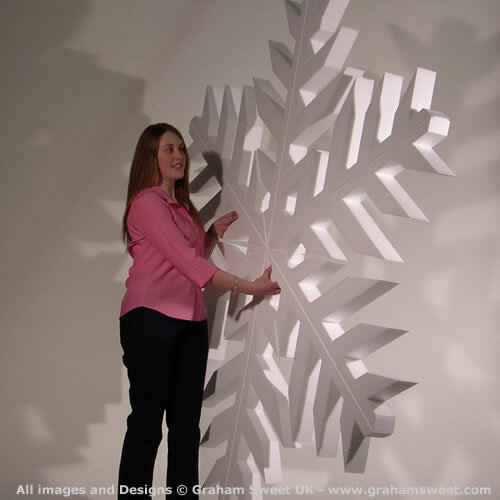 All our polystyrene snowflakes are produced from good quality, display grade polystyrene - containing a flame retarding additive. 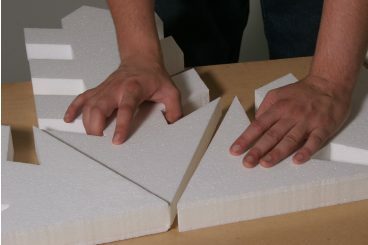 The smaller snowflakes, from 140 to 568mm high are normally produced form EPS100E, and the larger snowflakes from EPS70E. 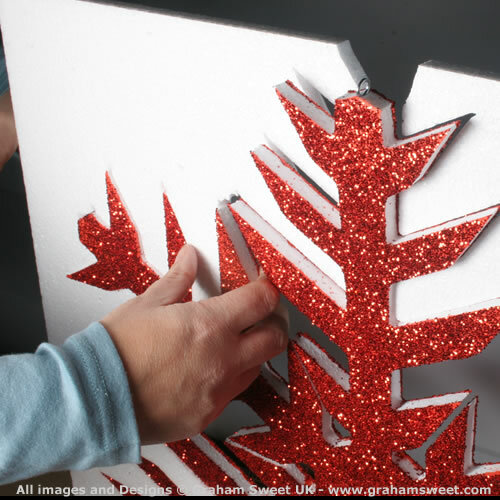 When applying glitter to the flat faces of the snowflakes, we do not use a flammable adhesive ( such as PVA ). instead, we use a special fire retarding substance, which increases the products resistance to fire - as well as increasing its strength and offering good adhesion for the glitter / frost. 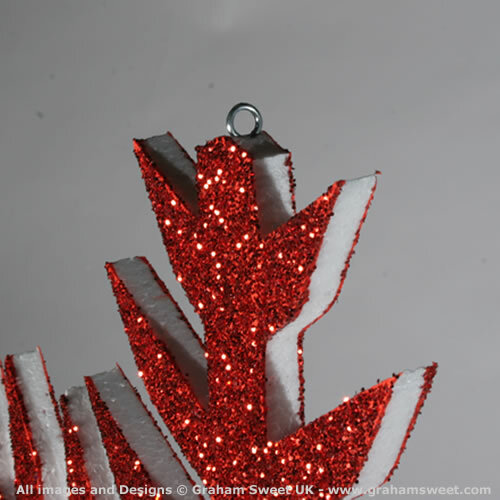 As standard, all our snowflakes come fitted with metal hanging points fitted to the top point. Unpacking & Displaying your Snowflakes. For the purposes of this illustration, a Red glittered Snowflakes has been used. 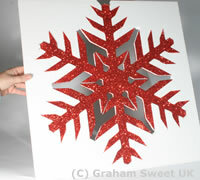 Snowflakes are standardly Plain white, but are available frosted, or glittered in your choice of colour. Click on any image for an enlargement. this will open in a new window, so watch out for your pop-up blocker! 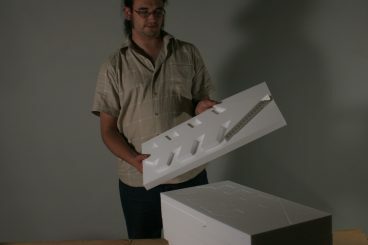 You will receive your snowflakes packed securely in a box. If you have ordered glitter snowflakes, please take care when opening the box, as some glitter may hace come loose in transit. 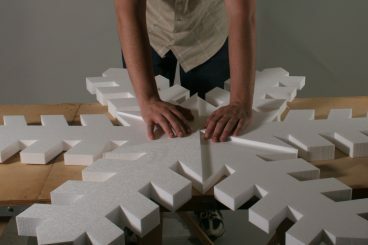 Each snowflake comes packed within a sheet of polystyrene. Take care when removing the flake from the packaging. Each individual snowflake comes with a hanging point at the top. Some of the larger snowflakes may have 2 points, but this would have discussed with you at the time of ordering. 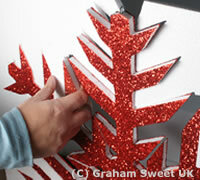 The smaler size snowflakes, (upto 1145 mm), can be suspended using a standard nylon. for the 877 & 1145 sizes, we reccomend a thicker nylon, especialy where they have frosted / glittered faces. 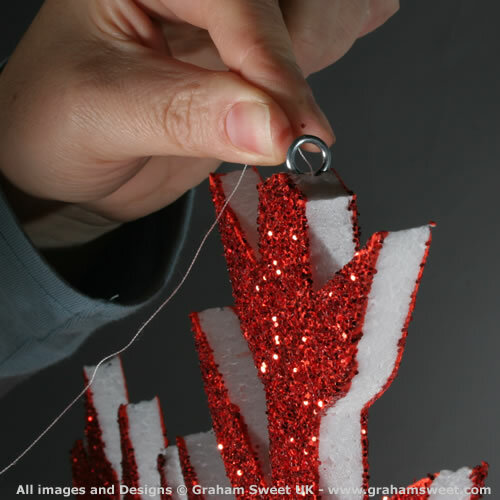 We recommend using hanging wire to suspend the giant snowflakes. 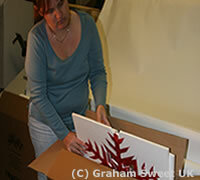 1) Remove all 6 branches of the snowflake from their packing. 2) Plug in the glue gun, and alow to heat up. be carefull not to burn yourself. 3) Line up the first 3 branches on a clear, flat table. 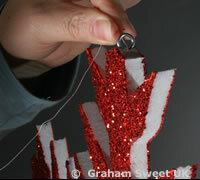 4) Line up the first 2 branches, Run a line of glue down the middle, and then firmly press them together. 5) Now, line up the 3rd branch, and fix this to the 2 that have just been stuck. 6) The first half of the flake is now complete. 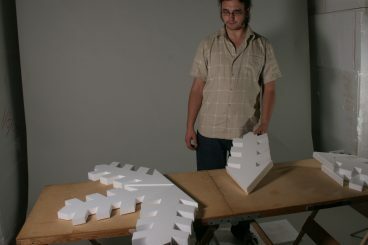 Now repeat steps 3 - 5, to form the second half of the snowflake. It is important that you complete the 2 halves of the snowflake separately. When the 2 halves are complete, line them up as shown. 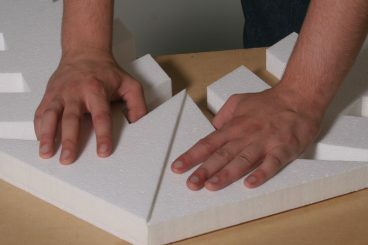 glue down the middle as before, then firmly press them together to complete the snowflake.